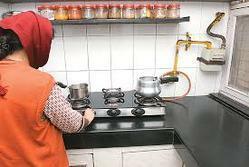 Agni LPG Solutions and kitchen technologies is the leading LPG Gas Pipeline Installation Services in Hyderabad. We are the pioneers in supply and installation of Domestic / Commercial / Industrial LPG pipeline services in Hyderabad. We also deal in kitchen equipment. We have well equipped and full fledged technical set up and well trained technical staff who are trained and headed by highly skilled professionals to care about the safety of our clientele. Agni LPG Solutions LPG Gas Pipeline Installation Services in Hyderabad has Safety as its priority. We have been striving hard to achieve the excellent safety performance. let us assure you, safety and quality is paramount than monetary benefits!. It gives immense pride to state that we have recorded zero accidents / incidents during our tenure. AGNI LPG Solutions LPG Gas Pipeline Installation Services in Hyderabad We are associate with a Prominent & Leading Manufacturer from Amravati, we offer Commercial Kitchen Stainless Steel Table, 2 Burner Commercial Gas Stove, 3 Burner Commercial Gas Stove, Stock Pot Burner, 4 Burner Commercial Gas Stove and SS Single Bowl Table Sink.